In football as well as in fashion, trends change. Long gone are the years where footballers would wear the traditional tracksuit top whilst warming up or walking out to the pitch. This is now no longer deemed as cool and for the most part not actually practical. It is not what footballers want to wear, so times have moved on and a mixture of practicality and fashion has meant that the mid layer jacket (or ¼ zip top) has taken over. Looking back at the last European Championships, this was certainly the proffered choice of the England team and it appears to have snowballed globally thereafter. 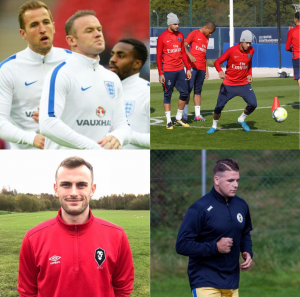 If you see the image below, you can see mid layer jackets being worn by England internationals Wayne Rooney and Harry Kane. You may be thinking that these are only worn by the mega-rich, well you are wrong. you may notice that also pictured is a mid layer jacket being worn at non-league side Salford City and by Devon-based team, Plymouth Parkway. A great piece of kit for use during training sessions and while standing pitchside before, during and after a match, mid layer jackets also look great when worn while going about day-to-day life. A trendy and fashionable alternative to the traditional tracksuit, nothing rounds the whole mid layer jacket look off quite like a pair of SWAZ skinny pants. Available in both child and adult sizes, SWAZ Mid layer jackets are designed to help regulate their wearer’s body temperature and keep them comfortable during warm-up and training. One way they achieve this is by combining a durable 100% polyester outer layer with a soft anti-pill fleece inner. It is available in plain navy or black as well as in 7 different colour ways to match your team’s identity. If you’re interested in learning more about the SWAZ mid layer jacket range, simply click on the banner below and you’ll be taken to our adult Mid Layer category.